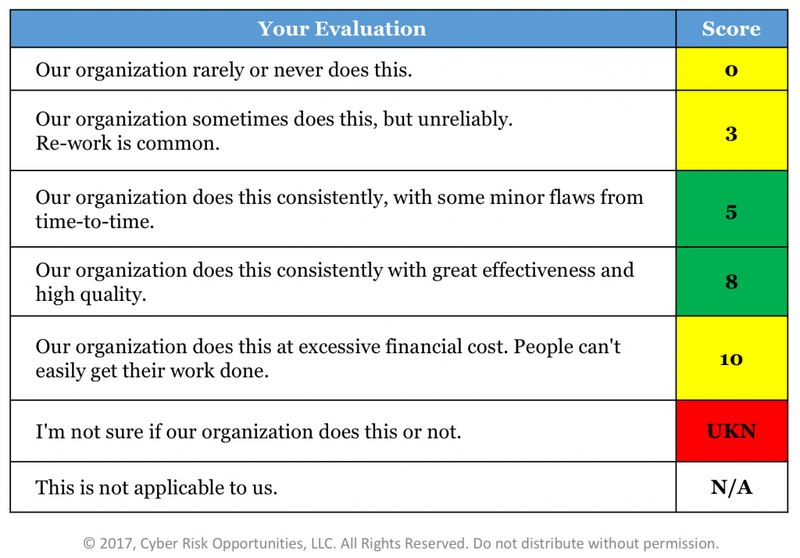 Last week, I described how to figure out where you will measure your information risks. Now, let’s see how you can create a simple yet effective way to turn expert opinions into numbers that we can use to determine the top risks. In order to collect reliable data from experts, you’ll need a consistent approach that guides them to translate their observations into a numeric score. We’ll base our approach on the zero-through-ten scoring system we previously learned about, and we’ll create a score key for the experts to use. We’ll also create a questionnaire for each expert in advance of the data collection to make sure we only ask for the scores that apply to them. For each numeric score, zero-through-ten, prepare a statement or two that describes how well any given control is actually performed. The number we get from the expert is called the Actual Score, and we record each one in our spreadsheet as we collect them. Remember that I’m using the NIST cybersecurity framework, so my lowest level controls are called “Outcomes” (also called “subcategories”). If the expert agrees with this statement: “Our organization rarely or never does this” then the score is zero. What if the expert agrees with this statement: “Our organization does this consistently with some minor flaws from time-to-time.” Then the score is five. Of course, experts are welcome to choose a score between these numbers. Note there are two other possible responses: Unknown and, Not Applicable. Although based on how carefully we prepared for the interview, these responses should be rare. Once your score key is ready, prepare one questionnaire for each expert. We’ll look at how to do this in next week’s post.